– the conical hills look good, shield the park from traffic noise, provide destinations for walkers and runners and offer fine views over London. They were made out of rubble from demolishing the old Wembley Stadium. That’s good too – but I wish they had salvaged some features instead of reducing everything to rubble. The landscape design was by FoRM Associates, a London practice which was run by Igor Marko, Peter Fink and Rick Rowbotham (the firm operated from 2007-2012). The founders were an artist, an architect and a landscape architect but the latter is not credited with the project: it was regarded as public art. My visit was a deviation from the route of London’s Capital Ring, which I have been following. It links a number of greenspaces of varying quality. I suppose I could set up a system to assess their quality and, if doing so, would remember the four lunches I have enjoyed in a four day trip. Each time I asked for a ‘bacon roll and cappucino’. Much the best was in a cafe near Eltham College – maybe the boys have trained them. The cost was £3.70. Next best was from a caravan in Richmond Park: £5.20 – good coffee and a very well cooked bacon roll for £5.20. Next best was from a cafe outside Harrow School: £7.20 for a decent coffee with a disappointing bacon sandwich. Worst quality was from a transport cafe beside Streatham Common: £2.70 for flabby white bread and tough bacon. ‘This is not coffee’ I complained after the first sip ‘Yeah – we don’t do coffee’ they told me. The compensation was free newspapers to read (Sun and Star only). Price is the easiest thing to assess but does not correlate with gastronomic quality (for which my assessment criteria were: quality of coffee, quality of bread and quality of bacon. Price does however correlate exactly with quality of service. The most expensive provider also had the best interior design, though it was very traditional. The seating area around the caravan in Richmond Park was a total disgrace ‘wood effect picnic seating made of solid plastic’. So is it true that ‘you get what you pay for’? No: if you want a coffee and bacon sandwich the best buy cost £3.70. The same is true of public open space: the largest budget does NOT produce the best design. Much better to deploy imagination, ingenuity and wisdom. This entry was posted in Landscape Architecture, landscape planning, public art, Public parks on 31st August 2013 by Tom Turner. Is Grannary Square London's finest new public open space? 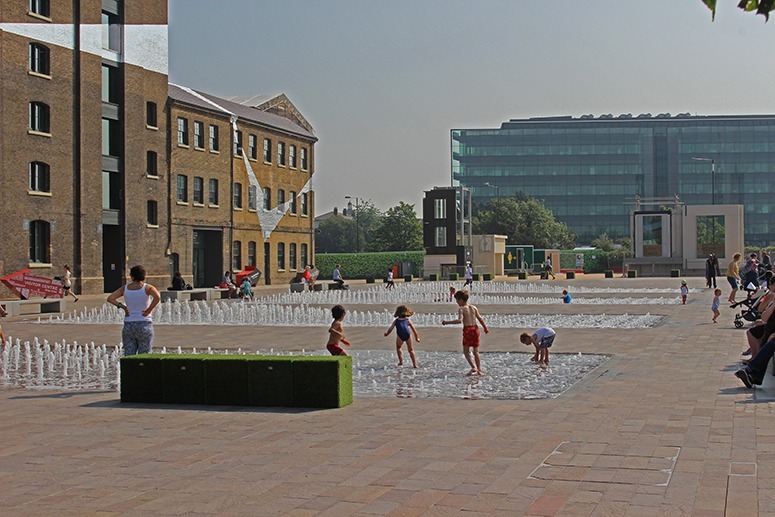 An Architect’s Journal comment welcomes Grannary Square as ‘London’s finest new public space’. So, many congratulations to the designers: Townshend Landscape Architects. It opened as a public open space in 2012 and had a great season in 2013 because of the fine summer weather. Rory Olcayto rates it a better contribution to King’s Cross than the work of its panoply of big name architects (John McAslan + Partners, PRP, MaccreanorLavington, Glenn Howells, Carmody Groarke, Stanton Williams, David Chipperfield, Allies & Morrison, AHMM, Feix & Merlin, etc). Olcayto could have added that Grannary Square is likely to outlive ALL the buildings – just as St James’s Park has, so far, outlived Whitehall Palace by 300 years. I see the design as a great start on what may become a great public open space. The design is strong and simple. The water feature is big and bold. The grove of trees with unfixed chairs and tables is a welcome homage to W H Whyte. The artificial grass steps, facing the sun and the canal, are a great success. All good. Grannary Square is a little blank and empty – but can be expected to fill up with people and uses as Argent’s King’s Cross Development gathers steam. As I was pressing the button to take the photograph, below, a distraught mother ran to me and cried ‘Excuse me – why are you photographing my children?’. She accepted my explanation and said that her husband was a photographer and often had similar complaints. I asked why she was troubled. ‘I don’t know’ she said ‘I just feel that it is my job to protect my children’. It reminds one of primitive peoples’ idea that something belonging to them them has been ‘taken’ when the camera clicks – and of girls who both want to be looked at and do not want to be looked at. Lin Yutang commented that ‘All women’s dresses, in every age and country, are merely variations on the eternal struggle between the admitted desire to dress and the unadmitted desire to undress’. Do mother’s want their children to be admired? 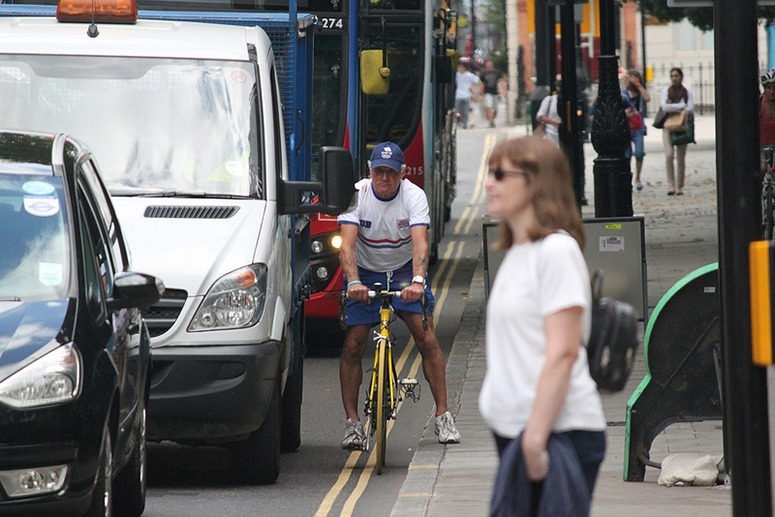 This entry was posted in Landscape Architecture, London urban design, Urban Design on 25th August 2013 by Tom Turner. Should the old urban landscape of Central Beijing have been conserved? 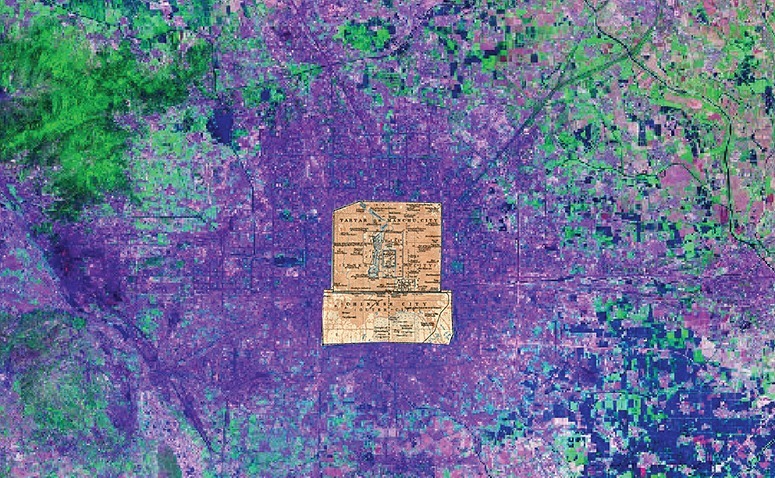 The montage, which is rough, shows a 1914 plan of Beijing superimposed on a recent Landsat image of the Beijing metropolitan area. When the reconstruction of the old city began, after 1949, Chen Zhanxiang recommended that a new city should be built outside the old walled city – so that the central area could be conserved. He had worked with Sir Patrick Abercrombie in London and understood the need for a city to engage in both conservation and development. Professor Liang Si-cheng commented that ‘demolishing the old wall is like peeling off my skin’ (Turner, T., Asian gardens: history, beliefs and design 2010, pp307-8). 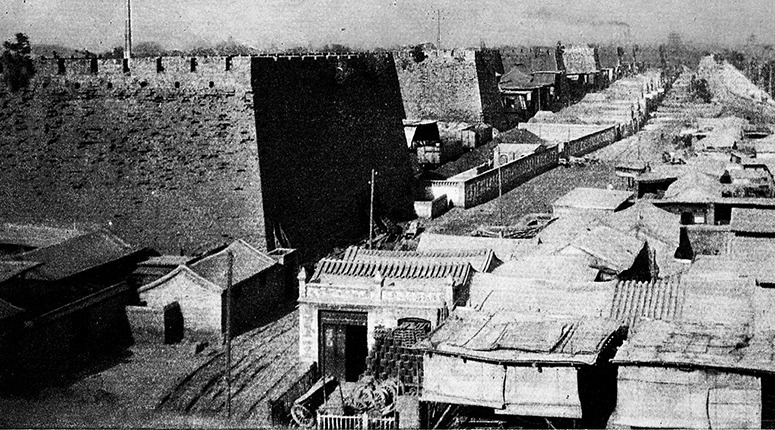 Beijing’s old walls, which became the 2nd Ring Road, are shown in the below photograph. Were the academics right or were the municipal authorities right? My vote goes to the academics. Central Beijing should have been as well protected from the twentieth century as Haussmann’s Paris. The two capitals have comparable design histories. But, for Chinese urban designers and landscape planners, there were other problems. The old map makes a distinction between the ‘Tartar or Manchu’ Inner City (which contains the Forbidden City and the three Seas) and the ‘Chinese’ Outer City. The Manchus were invaders who spoke a different language. Their walls were a symbol of exclusion and repression, like the Berlin Wall, and were demolished by Chairman Mao’s government. Had the French and British not demolished the Yuan Ming Yuan, Mao Zedong might have done it for political reasons, much as he destroyed Buddhist monasteries. Mao’s position in Chinese history is peculiar. He will always have credit for modernising the country and educating women but, one day, he is likely to receive even more blame for the Cultural Revolution. He will also be blamed for destroying too much of China’s architectural and landscape heritage. So here is my advice to municipal authorities everywhere: find the best parts of your heritage FROM EVERY ERA and apply the most stringent conservation measures possible. This will require landscape assessement technqiues. The ‘blocky landscape’ of early 21st century Beijing will be disliked, sooner or later, but a good-sized zone should be subject to strict conservation measures – including those ridiculuous ‘flower beds’ which line any roads wide enough to have them. This entry was posted in Asian gardens and landscapes, context-sensitive design, Landscape Architecture, landscape planning, Urban Design on 20th August 2013 by Tom Turner. Etymologically, economics is the study of the laws (nomos) which govern homes (oikos). But economists work with a rarely-spoken assumption that what matters is how to get wealthier. I have been reading a book by the Harvard economist, Edward Glaeser: Triumph of the City: How Our Greatest Invention Makes Us Richer, Smarter, Greener, Healthier, and Happier. Despite the long title, what he really wants is to make America ‘richer’ and less dependent on carbon fuels. He praises Chinese cities for the low carbon consumption of their residential areas and criticises people who live around San Francisco (eg Marin County) for opposing as much new building as they can. The city of Houston is praised for encouraging as much development as possible but criticised for letting it take place a low densities. The city of Paris is praised for conserving its central area (within Périphérique) while allowing high buildings at La Défense. Glaeser does not say much about London but his views can be assumed: (1) London has a less-sensible high buildings policy than Paris (2) London should retreat from its policy of restricting high buildings (as Boris Johnson is doing on London’s South Bank) (3) London should convert its Green Belt to a Development Zone for a Chinese-style high-density city. China does not, in fact, have a city on the Wiki list of the world’s 50 most densely populated cities. Eighteen of them are in India and I guess Glaeser knows that this is not how Americans, or Europeans, want to live – however good this urban style may be for reducing carbon emissions. The Wiki list is topped by Manila (at 43,07/km2 ). The densist city in America is New York (at 10,640/km2). Delhi has 29,495/km2. Paris has 21,289/km2. London has 5,285/km2. Sydney has 2,058/km2. Image courtesy Deivis. 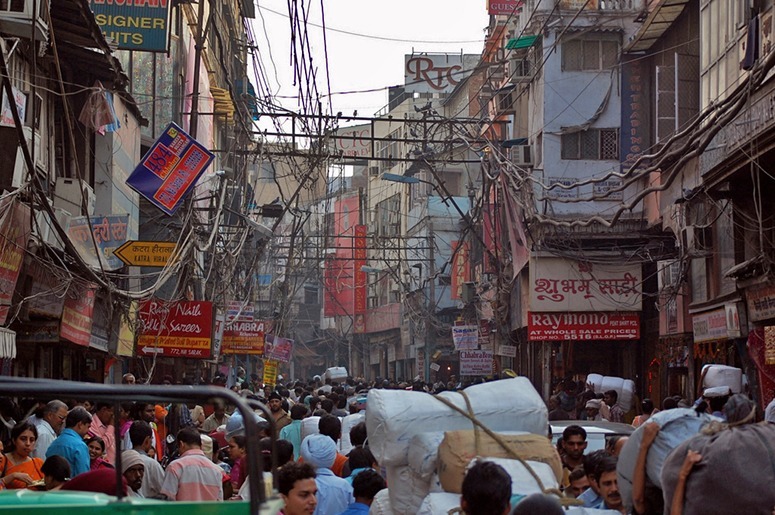 I once took my bicycle through Chandni Chowk (‘rode’ would be an inappropriate word) and, having marvelled at its low carbon usage, urge western advocates of sustainability to follow my example. This entry was posted in Landscape Architecture, landscape planning, Urban Design on 8th August 2013 by Tom Turner. Many people are in fact asking these questions and they could put be on school curricula – in Europe, in America and, most of all, in China. Similar catastrophes happened in Europe yesterday and may be expected in China tomorrow. In Britain, as the Guardian explains, the school history curriculum is too focussed in Hitler. It is a preposterous state of affaris: the man is dead. His ideas are dead. Everyone hates him. Really, one would think school history teachers had heard about this. So why is Detroit going down the drain? So I cannot answer the question – but other cities have found ways of dealing with the declines of their auto industries and, in due course, it will be interesting to see what policy China adopts for its soon-to-be rustbelt industries. Karl Marx explained that creative destruction is integral to capitalism – and China has become a capitalist country. So what can be done about Detroit? Edward Glaeser, in Triumph of the city (2011 pp 64-7) recommends a policy of ‘shrinking to greatness’. Following the examples of Leipzig in Germany, and Youngstown in Ohio, he recommends demolishing empty buildings. He writes that Mayor Bing, ‘knows that Detroit can be a great city if it cares for its people well even if it has far fewer structures’. Instead of ‘demolition’ I recommend a plan for regenerating the city’s ecosystem. It needs a habitat plan: for humans, fauna and flora. Humans need safety. Perhaps the 25% of the city which is now un-inhabited should be demolished, or perhaps the empty buildings should be fenced off. I don’t know – but high schools would surely learn more from studying Detroit than from studying Hitler. A class could begin with an old Detroit-made car. Kids could learn to take it apart, clean it up, put it back together and drive round the playground. While doing this they would learn about physics, architecture, chemistry, industrial design, labour relations, politics, economics, trade unions, finance, pensions, international trade, entrepreneurship, urban design, database management, landscape architecture, ecology – and, of course, an approach to art and music which draws upon the Nature of Detroit. ‘Ah’, you may say, ‘good idea – but school teachers know nothing of these subjects’. Well then: they should not be teaching kids who need to know about these subjects. This entry was posted in Landscape Architecture, landscape planning, Urban Design on 3rd August 2013 by Tom Turner.